Everyday I receive questions about olive foundation matches. I feel you girlfran, my google search history is populated with ‘olive foundation matches swatches green foundation plz halp! much frustrate’. Oh hey that’s right, I’m a blogger! Let’s start a olive-foundation-database of sorts. The two controls on the right are (top to bottom): MAC Studio Fix in NC20 (actually a cooler yellow tone) and Armani Luminous Silk in 5.5 (a warmer, peachy hue). The most olive of the bunch: Koh Gen Do Aqua in 213 and Armani Luminous Silk in 6. Koh Gen Do – Aqua Foundation in 213* // This one is discernibly green, even amongst olive foundations. A depth of about NC20ish. Finish is on the dewy side and formula is best suited for normal-dry skin types. Review here. US buy. AUS buy. Bourjois – Healthy Mix in 52 // This may be the palest of the bunch but still around an NC20ish in depth. Not quite as olive as the KGD but definitely on the greener spectrum. More coverage than the Koh Gen Do, satin finish and best suited to a ‘normal skintype’ (not particularly oily or dry). Review here. US buy. AUS buy. Urban Decay – Naked Skin Foundation in 4 // I actually haven’t tried UD Naked Skin yet (might feature in the next foundation first impressions) but many of you guys mentioned shade 4 leaned olive so I picked it up. I eyeball it at around NC27ish (?) and it looks to be a warm olive. US buy. AUS buy. Tom Ford – Traceless Perfecting Foundation in Fawn // About an NC25 in depth (though Fawn runs lighter in the other Tom Ford formulas, be wary). Another warm olive, this formula is crazy long wearing but not particularly smoothing on pores/texture/peach fuzz. I think it would be best suited to combo/oilier skins. US buy. AUS buy. Charlotte Tilbury – Magic Foundation in 6* // About an NC25-30 in depth. This does have an olive lean but not for the super green-skinned. Demi matte in finish but not particularly long wearing  I have reviewed it in a first impressions video here. US buy. AUS buy. Armani – Luminous Silk in 6 // About NC35 in depth (can anyone confirm?). This one is actually uber green (although it may not look it in this swatch), so much so that I actually use this as an ‘olive mixer’. US buy. AUS buy. Depending on the time of year, I swing between an NC20 and NC25. I’m close to an NC25 in depth at the moment so Koh Gen Do Aqua 213 and Bourjois Healthy Mix 52 are too pale for me right now. Tom Ford Traceless Perfecting in Fawn is a good match but I’m not the biggest fan of the formula (on my dry skin). Charlotte Tilbury Magic Foundation in 6 is a touch deep and Armani Luminous Silk in 6 is much too deep (hence the ‘olive mixer’). Any other olive foundations that I should add to the database? Any depth is welcome  Beggars can’t be choosers lol. maybe a little bit off topic, but I am a little bit struggling. I used to have the misture cover concealer as my foundation in NW20 or 15, but I never really liked the is pinkish on me. I have lots of red on my face, but I ordered a sample for Armani Luminous Silk in shade 5.5 a little bit too dark when i am first putting on (but I love how neutralize everything on me ) later on it blends or fading away… nut sure 😀 would like to have the same tone just little bit lighter which I think 4.5 isn`t the one. Could you help me which would be it? It’s difficult for me to recommend foundation matches online. If you’re between NC15-NW20, Armani Luminous Silk in 4.5 might match you (it’s leans a little yellow so will neutralises redness). I have the Healthy Mix in 51, and Healthy Mix Serum in 51 and 52. I consider them all to be on the olive spectrum, but HM Serum 51 is a bit greener than HM 51. Aromaleigh gossamer variable coverage mineral in a few sample shades (1YL, 1Y, 2YL, 2Y). The owner was super nice helping me figure out what to try and is a light olive herself. She thinks one of the YLs (yellow-linen) may be the best match for me to balance the olive and yellow. Illamasqua Skinbase in 8.5/11.5! They are olive skin heaven! I’m with you – I’m basically green, foundation hunting is hard!! 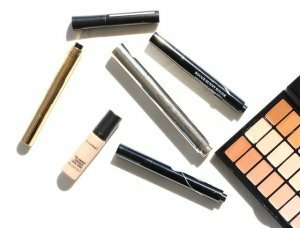 I have cool olive skin that sits at around NC10 in depth, and my closest match is MAC Face & Body in C1 + White! I do three drops of C1 and two drops of white. ABH will soon release a ton of stick foundations with an olive range, ranging from the palest to the darkest! Hmm, I wonder if they will truly be olive. I notice a lot of companies call tan skin olive. I self-diagnosed as having olive undertones only yesterday and hopped here today to check if there are some foundation recommendations, though I am paler than you, and lo and behold ! I’m still struggling, lol, I never really detected green hues on myself (maybe I’m just colorblind?) and have identified as ‘warm’ and ‘jaundice yellow’ since I got into makeup. My first clues were that a lot of blush shades pull orangey, even though there are some pink blushes that stay properly pink and the fact that gold actually doesn’t look as great on me as it should. Also, I never really burned in the sun despite being pale, though I am super diligent about SPF, but back in the day when the task of SPFing myself was still in charge of my parents, my skin would at worst turn reddish and then tan, although poorly. Guru Makeup Emporium (UK based) carries MUFE, and I believe they ship worldwide. (gurumakeupemporium dot com). Thanks a lot! I went back to MUFE site, apparently they have two of their own stores in Paris, so I’ll try my luck there first. You may want to try Urban Decay Naked Skin in shade 1. It’s not quite as olive-y as shade 4, but it’s got enough green in it that I can make it work for my pale olive skin since most olive foundations are too dark for me. Rimmel Lasting Finish foundation in shade 100 Ivory also has olive undertones, it looks like it’s similar to the KGD Aqua in 213, though maybe a bit lighter. It’s darker than UD Naked Skin shade 1, and also has stronger olive undertones. Those are the two that have worked best for me so far. Thank you, Christine! I’ll make sure to check those out. So far, I’ve been using Bourjois CC cream in Ivory, Bourjois Healthy Mix Serum in 51 and Foundation in 51. The CC cream has a slightly rosy/peachy tint in certain lights, and I prefer Healthy Mix Foundation to Serum because it’s less orange on me and the finish looks better. Nice Suggestion April. I agree with you! Jaundice yellow sounds rather olive to me 🙂 MUFE HD 117 is rather olive, I concur. ❤️ Thanks for the swatches! Yes, lets start that olive foundation data base! There is a clear business opportunity if anyone spotted it… Green people are clearly underserved in the foundation market! Specially fair olive people. Some brands equal olive with only deeper skin, and don’t cover all depths…. Yeah I agree. Whilst olive girls are already under-represented in the foundation market, I find that both spectrums are difficult to find. Olive girls below NC20 and those above NC30 hardly have olive matches. My experience is of the latter and I find that people immediately assume that as long as you’re above NC30, you’re definitely a warm yellow shade or a beige shade and any claims otherwise shows some sort of misunderstanding of skin tone. Some Indian girls tend to lean olive actually; I do wonder if the Indian market caters to this. As an Indian I can assure u that the Indian market does not cater to olive tones at all! my only success story with olive foundations was with the nars ADLW foundation in shade Stromboli..I’m around mac nc 35-40 and though the shade stromboli was an almost perfect match I was’nt satisfied with the formulation..its more of a full coverage matte foundation, not very suitable for those looking for a light daily wear foundation but could work well on oily combination skin..I’ve also tried the UD naked in shade 4 which is a lot lighter than Stromboli but quite olive and has worked on me in certain lighting. Next on my list is the Armani luminous silk in 6! Thank you for this, very insightful! I also had the suspicion that on my light olive skin foundations that are too green make me look sick, but wasn’t quite sure. Helpful to hear others have this impression too! 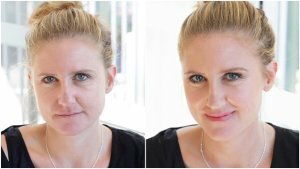 Do you have problems matching your face with your neck when you are wearing a foundation that is rather beige toned? Hi there! I like warming up my neck and chest area with some bronzer or warmed-toned powder; when I do that, plus contour and blush in the face, it all looks harmonious enough. But when I don’t do that, I don’t concern myself too much with any difference. We’ve been sold the idea it all should be the same color when, if you look your own – and other people’s – face, neck and chest, they tend to be different colors! As long as you don’t end up with a floating head, you’ll be alright! Personally, beige foundation read very pink or ashy on me so they don’t mesh well with my neck. Love mufe in y225 for the yellow undertone but don’t get the longevity from it. Nars sheer glow in deauville too but still searching for a long wearing version with the same colour match. Have you tried anything at all to help with longevity? Primers? Setting powder? What’s your skintype? For a point of reference, when I compare it in shade to Charlotte Tilbruy’s Magic Foundation in 6, it looks more green and less yellow. Hey Karima! What shade would you be on the Armani Luminous Silk taking into account you are just like me? (Nc25-30ish?) I own it in 4.5 but I believe it leans rather peachy so it isn’t my best match at all. Thanks soooo much. I don’t have a perfect match in Luminous Silk, I mix shade 6 with 4.5 (less peachy than 5 or 5.5, actually). OMG, I think you are my skintwin and it is amazing you pulled this list together. 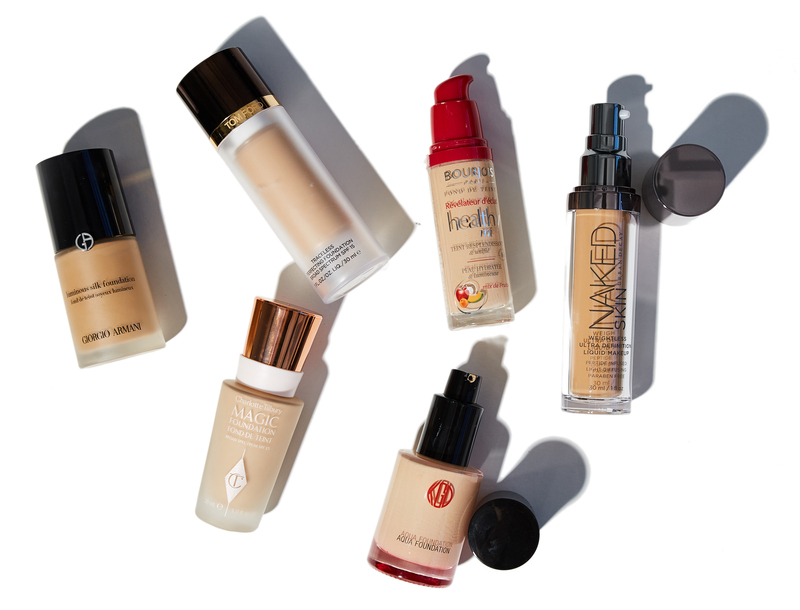 I have struggled with foundation for years (everything EVERYTHING turns ORANGE) and my epic journey has brought me to now; having almost every foundation listed here in my stash. I like TF Fawn. It isn’t absolutely perfect tone wise for me, but spot on level wise, and never a bad choice. I absolutely wish The Tom would come up with a mature skin friendly foundation formula with medium buildable coverage. Is that too much to ask? UD Naked 4.0 is too warm, dark, and too golden yellow, not that little hit of green I need. KGD 213 is too green. CT Magic 6 is too dark, fairly good balance of green and yellow, but I despise the formula.. zero staying power. I could go on at length.. I won’t. I just had to share that I am blown away and found it a positively eerie experience to read your post. LOL how funny, we’re having the same struggle! I think L’Oreal True Match in W7 and Rouge Bunny Rouge in Cashew are downright green, although I just add a drop to white-base sunscreens to make them workable (I’m NW/NC 15-20). I may have to try the Bourjois. Thanks for this post! I’ll take a look at W7, would be nice to have a drugstore alternative! Correct, HM 52 is much greener than HMS in 52 (the latter is also lighter, if I remember correctly). Hi Karima! Thank you for this blog post! I have just started hunting for a HG foundation =p I just bought Bourjois Healthy Mix in 52 but sadly, it is too orange and a little dark for me. Does it mean that my skin is more towards warm olive or cool olive undertone? Have you tried EX1? They market themselves as an olive foundation. It’s strange, based on online swatches they don’t look green at all?! Thanks for the swatches! Yes, the Armani Luminous Silk in 6 would be a good match for NC30-35. Other additions to your mixer type foundations is Becca Olive and Cover Fx G50. They are both very olive around the NC 30-35 colouring. Yes! The Armani foundation is my HG! Even Makeup Forever Ultra HD, with its great shade range, doesn’t have an olive shade to match me. I either look ashy or orange. It’s a bummer, especially since Ultra HD has a wide shade range but NOT QUITE RIGHT lol. Try the Cover FX in 25N or 30N. The bigger problem I have is that when I try to conceal my under eye circles with “one shade lighter” it inevitably looks ashy. Like you, I worship at the House of Eldridge, and while I can generally use her bases, her beloved Clinique air brush concealer in neutral fair is a disaster on me. For a while the Naked concealer was my favorite, but at some point I started to develop spots from it. I guess some bacteria got in the tube or something (which I thought was an urban legend!) Right now I am LOVING Bare Minerals liquid concealer in Medium. It has the most concentrated color I’ve ever seen and rather good staying power as well. Of course, I can’t wait to try Kat von D’s new Lock It concealer, out any day now…. So, I am NC35, and Armani Luminous Silk 5.5 suits me perfectly. Are you olive? That one runs very peachy on me. Where does one get the White Lightening drops mentioned below? Thank you Shelly. I’ll get some MUFE today! Face Atelier ultra foundation in zero minus is a white that can be added to lighten foundations. Yes please on the Urban Decay as the next foundation first impression! I’ve been eyeballing it but am unsure if it would add anything to my already absurd stash of foundations – thanks so much, Karima. I recently sampled some of the Koh Gen Do Aqua range — namely the light-to-medium shades. 213 is the only olive shade. All the others have a peachy undertone, at least on me. I share your frustration as a fellow pale person. Virtually every foundation I’ve tried is either too pink (e.g., Revlon Colorstay Combo/Oily in 110 (which also oxidized), the late Becca Luminous Skin Colour in Porcelain), too yellow (NARS Sheer Glow in Siberia, the late Becca Radiant Skin Satin Finish Foundation in Shell), or too peach (the late Illamasqua Light Liquid Foundation in 115, MUFE Mat Velvet+ in 115 Alabaster, MUFE Ultra HD in Y205 (also, surprisingly, a smidge too light! otherwise, love it), MUFE Ultra HD in Y225/117 + MAC F&B in White). I think my own undertones are straight up neutral beige. Colour correcting drops may be our solution. In another comment I mentioned MUFE makes white drops for lightening purposes. They also make some colours — red, blue, and yellow — to use for colour correcting a shade. (They also come in brown and black.) It’s called Chromatic Mix and comes in two formulas — water-based and oil-based. Thank you! I guess I’ll just have to keep searching, but I will definitely take a look into these color correcting drops (even though they are quite expensive and a bit hard to find where I live. It’s still a good option, nonetheless). The white corrector is ridiculously sheer. I’ve used it without much success. The other colors are a lot more pigmented, though. Good luck! I still haven’t found the right mix, but I’m currently testing out MUFE’s new waterblend foundation in 215 and 225. 225 is pretty olive, but a tad dark on me. 215 is a tad light and just a touch peachy on me. I’ve mixed the two, but it does take away the olive-ness, so my next test will be to mix yellow chromatic mix into the 215 and see how that goes. It’s so difficult to find foundation when you’re this pale and olive; almost everything is too dark or leans too colorful, for lack of a better word. The most frustration part is that makeup artists think I’m darker than I really am because they’re mistaking my olive tones as a deeper complexion. Short answer: No lol. I find that some ranges will offer one or two olive shades and the rest run warm/peachy/pink. Irritating! Thank you for this post. I’ve never really known that I have an olive colored skin until I discovered your blog/youtube channel. I just always had problems with picking the right color because it was either too pink on me or too orange. I’m an NC 20-ish (-ish because it’s too pink but the next color is orange on me) but no one will describe as pale but I’m not dark either. People describe my color as light yellow (Weird. I know. And no I’m not jaundice). I could never achieve that no makeup makeup look because the color was never right. Until I saw this post and tried the koh gen do 213 (I live in the Philippines and this is the only product I could get my hands on). The girl at the counter told me that 213 was too dark for my skin tone and wanted me to try the 123 because it was lighter. But when I tested it side by side the 123 made half of my face look like I stayed too long under the sun. The side with 213 looked like I had nothing on but inner glow. Halleluja! (Or more appropriately: KARIMAAAAA!!!). What a revelation. Thank you! hey karima! how would you compare the TF stick foundation in fawn vs the traceless foundation depth wise? I’ve been mixing Algenist REVEAL Concentrated Color Correcting Drops in green with foundation. It is meant to be worn before foundation to color correct redness, but if you mix it with foundation it makes it more olive. I am darker than you. KGD 213 is too light for me. I may have to try the Armani Luminous Silk. don’t have a green foundation recommendation but makeup atelier makes this fluid concealer with a shade called “olive green”. And it’s like… straight up olive. Formulation is superb too. INTERESTING! Sounds epic, will order one. Karima, is the Armani Lasting Silk in 6 as olive as the Luminous Silk in 6? Glad to see more green foundations popping up on the market, but being a green-ish NC10 is still a struggle. I’ve been mixing the Bourjois healthy mix in shade 51 with Makeup Atelier’s white base for years now – the only combo that works. PS: Have you heard of the NIOD Photography fluid at 12% opacity? It’s an illuminating base of sorts and it seems to have a slight olive pearlescence to it. I wonder if using it as a primer could correct yellowness/add greenness to a sheer neutral foundation for example. Cristina, I have the same struggle! I have used Bourjois on it’s own, but it wasn’t quite right for me either, so I’ll have to try your mix. Much thanks! I’ve heard good things about the NIOD, will do more research! I’m light and olive toned. MAC NC20 is a pretty good match but their foundations always made me break out and MUFE HD in Y235 is almost perfect but I hate the new formulation. I’ve had nice success mixing in NYX HD concealers in 12 (green) and/or 10 (yellow) with Too Faced Born This Way in Pearl (which is slightly too dark/orange out of the bottle) and, for greasier days, MUFE Mat Velvet in 20 (too pink-toned). I’ve also tried the MUFE chromatic mix in yellow, and it’s ok, but it does darken the shade a bit. I’d like to add to the list MUFE’s new Waterblend foundation in 225 and maybe 215 (thought that’s marketed as yellow). The shades in the waterblend don’t correspond to the other foundations in their line (the MUFE standalone store artists told me that on three different occasions I visited), and they’reapparently a little lighter. 225 is noticeably olive, but it’s a tad dark on my skin, but 215 isn’t yellow/olive enough. It’s probably going to take some tweaking and a combination of their chromatic mixers, but I wanted to at least mention the foundations! What is your approximate depth, in MAC terms if you know it? Karima, although I don’t have the olive skin tone, I have enjoyed your discussion of undertone in general and how important it is. If others feel they don’t look good in foundation, I think this is the reason why. I am 55 and pretty much hated foundation all my life. Now I know the reason is so little foundation matches my skin tone and undertone. I’m light with a pink undertone. Most line’s lighter tones are yellow undertone, or their very fairest has a pink tone but is too light for me. Finally about 5 years ago I found Chanel Beige Rose – ahhhh. Unfortunately then they discontinued this color in the CC cream I loved, and I haven’t loved the other formulas they have in Beige Rose yet, so I’m on the hunt for a new foundation. Even though you do not have my exact coloring, you are my favorite beauty blogger so far. I’ve really benefited from your recommendations for matte shadows and dry sky-related products. If you’ve run across any good pink undertones in your travels, us pink girls would love to hear about it! Good to know, thanks love! I can absolutely concur with this comment! I use both and they are the best matches I have. I would add the Healthy Mix in 53 as well, it’s perfect for when I’m pale. Yup – Georgio Armani luminous silk 6 suits me fine and I’m an NC35 (well NC35 is yellower but we’re definitely of similar depth). MUFE ultra HD/ HD foundation in 123 is also actually quite a decent olive match for those about NC30-35. It is less olive than GA luminous 6 but good for those who have a higher level of warm yellow in their skin tone OR frequently tan easily from being in the sun. Finaly I found a girl that have pretty much the same skin tone like I do. I strugle a LoT to find my colour in Any foundation. There is One foundation that can suite me but I cannt try it since its available only on Line which is the EX1 invisiware foundation which is for olive skins. Did you try this One ?! Based on swatches online, the EX1 line doesn’t look particularly olive! I use the Tom Ford in 03 Fawn as well. It’s my day to day foundation. I totally agree that it isn’t very forgiving with dry skin and pores (my dry skin is dreadful), but when I use it I just make sure I’ve used a good moisturizer and I use a primer over my nose, chin, and any area that may have pores on my skin or are prominent that day. The foundation being a bit on the lighter side, I use my Suqqu cheek to contour my cheekbones with a gray-er toned blush or bronzer so it looks more natural. It tends to work well for me! Otherwise I add half a pump of a different foundation (still olive but slightly darker) in the summer because my skin shade changes. Thought I would share as TF is my HG foundation!!! Glad you found one that worked for you! This one picked up on peach fuzz on my face, which is odd because I have very little! first: I love your blog! 🙂 You are so thorough, it is really, really helpful (and also very enjoyable). As a recommendation I (slightly hesitantly) would add MAC’s Face and Body in C2 and C3. I use them both, and most of the time like them – but (and this is why this is a hesitant recommendation) sometimes they seem to be a bit off on me and I don’t know why. I am quite light in my face (around NC20), but much darker on my body, so that it is often good for me to use a darker foundation (this would be the C3). And I am visibly green! Karima, Boots No7 Airbrush Away in the shade Honey is super grey/olive!! Not sure if the honey shade in their other foundation lines are olive too. Ooh, I’ll take a look, thank you! Hi Karima, Just discovered your blog today- love your direct and detailed descriptions. You’ve created an amazing reference source. Thank You! Notes: Lancome is a perfect match- they have a number of “neutral” (olive) shades, so you might want to check them out. The Makeup Forever Water Blend is known to oxidize a little bit (I was told this from one of the artists working in their stand-alone store), so go a little lighter than you think you need. Hmm I’ve tried to buy the MUFE Water Blend on numerous occasions but I can’t seem to find a decent match, will try again! Hi Karima. Thank you so much for doing this post. I have such a hard time finding light olive foundation for my skin. How did you like the Urban Decay foundation. Do you think it’s suitable for oily skin? Thanks again. You and Sharon rock…love your videos! I haven’t played with the Naked Skin foundation enough to form an opinion but I’ll post about it when I do. Have you seen the All Nighter Foundation? I’ve heard that performs well on oily skins. Hi Karima! I I am an NC25 and rely on your reviews for color matching! I am an NC30-35 in summer and LOVE Armani Luminous Silk in 6 but now that summer is over, I am struggling to find a good match for my skin. Do you have a Luminous Silk shade recommendation for the NC25 range? And if not, what would you recommend in terms of another brand/formula? I have combination skin and prefer a light/medium to medium coverage foundation. I am also a true olive so I find all of your reviews incredibly helpful! I was wondering though, if you had any recommendations for olive skin friendly powder foundations? 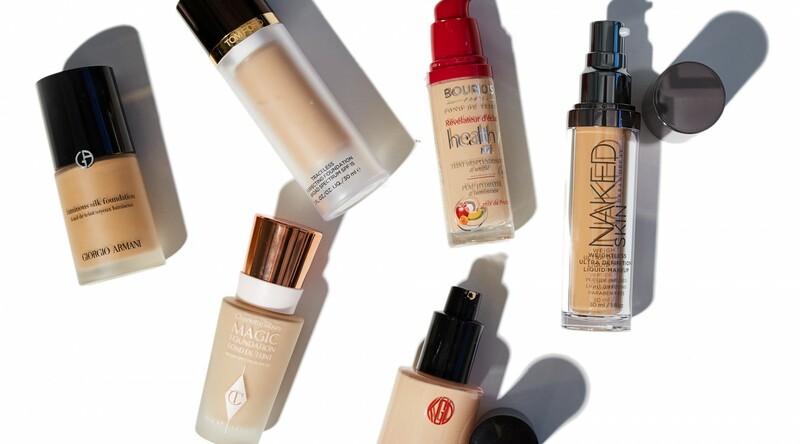 While I love my Bourjois mix for full face days, on days at university I consider myself very polished if I can manage under-eye concealer, mascara, and a light dusting of powder. So far though, I have yet to fin a good shade match in a powder, so any insight would be greatly appreciated. I’m not much of a powder foundation wearer but I do like the SUQQU Dual Effect Powder Foundation, the shade 002 is a cool yellow and a similar depth to the Bourjois No52. I am also NC20-25 olive-toned. It’s so difficult to find the right match. Most makeup artist tell me that I’m “too light” to be olive. They associate olive with tan skins only. Even if I find a lovely formula, I can’t find a color match. The best match so far has been Tom Ford in fawn, but I disliked the formula for reasons you stated. My favorite was the Laura Mercier oil-free foundation in sunny beige until they change the formula. Why God?!! I’m still on the hunt for my HG but until then I’ll just have to make due with Chanel vitalumiere aqua 30. Have you tried the Koh Gen Do Aqua in 213? It’s a similar depth to Tom Ford Fawn. Hey Karima, have you tried the Bourjois CC Cream? Great undetectable formulation and the colour “beige claire” is very green. I really like it! My HG was Lancome Teint Miracle (old version) in O-03. It was a perfect olive. Then they change it to more watery texture and lesser coverage, ugh! I love the Koh Gen Do 213, but it is too late on me. I make it work by mixing it with other foundations or use it sparingly. I’ve not determined if I’m olive or just straight up yellow. Even when I think my face matches my body, when I look in a mirror outside my face still looks noticeably pink/grey compared to my chest. Currently, I am mixing the KGD 213 with Kevyn Aucoin sensual skin enhancer 08…it’s just really frustrating! I love the Koh Gen Do 213, but it is too light on me. I make it work by mixing it with other foundations or use it sparingly. I’ve not determined if I’m olive or just straight up yellow. Even when I think my face matches my body, when I look in a mirror outside my face still looks noticeably pink/grey compared to my chest. Currently, I am mixing the KGD 213 with Kevyn Aucoin sensual skin enhancer 08…it’s just really frustrating! Hi Karima! I look at this post all the time. I have an odd question. The back of my neck is uber tan relative to the rest of my body (apparently I forget to put sunscreen there?) and no foundation matches my lighter olive skinned face. I’m wondering if I should just match foundation to the back of my neck in the winter since I have matches for that, like the GA luminous silk 6. But then my hands will look more pale in my chunky sweaters….I guess which is better? Matching my darker neck and retaining my olive undertone or trying to keep my face light even when it then looks awkwardly peachy? Hi Karima! So which shades in the luminous silk line run more olive? and out of the following shades which are more yellow or olive and less peachy? following shades: 4, 4.5 , 5, 5.5, 5,75 and 6? Hey Karima, great post but I find the line ‘beggars can’t be choosers’ to be racially inconsiderate considering that you’re part of the most targeted market segment of the beauty industry: caucasians. What do you think the struggle is like for someone who has the deepest brown complexion? I just wanted to give a little tip for fellow olive-tones… If you have a foundation that is too orange or yellow, or even peachy, mix BLUE in with it…I used to be quite into painting, thus very in-tune with color theory…opposite colors will basically cancel each other out when mixed. For example, if you mix red and green paint, it will become gray. A perfect lack of color. So: blue is the opposite of orange. When you mix a little bit of blue in a foundation, it helps tone down the orange coloring. It won’t make it gray of course, but if you add just a little bit, it really cuts back on the orange. ANOTHER thing is, as we all know, blue mixed with yellow makes green…and most foundations have at least some yellow in them! So adding the blue will not only cancel out the orange, but also add a hint of green color! 🙂 I have seen this tip mentioned here and there on the internet but wanted to share here in case anyone would want to know. I do not know if this would help with pink-toned foundations. For those maybe mixing in a bit of green concealer would be better but I don’t own any pink-based foundations so I can’t say. Blue mixing with pink would make a more purply color, but it depends on the amount of pink compared to the amount of orange and yellow in the product. I’ll have you know that I just spend half an hour calling EVERY Nordstrom, Sephora, and even freakin’ Barney’s in the area where I live (major metropolitan area, too, so you would think someone would have it!) trying to find the Koh Gen Do foundation in person. I hate phones and I hate calling people, but “this product is literally green” has me sold and I called like six places. I have been trying so hard to find a foundation that actually matches my fairly pale olive skin. Everything so far has looked like a pink, orange, or yellow mask on me. The prospect of something that is actually a good undertone match overcame my hatred of phones. So thank you for this post so much, you may have actually made makeup wearable for me?? I had kinda given up hope of anything ever looking good. Fingers crossed that the 213 is a good match!